Q61. Can advertising give you a wealth of information about a country? 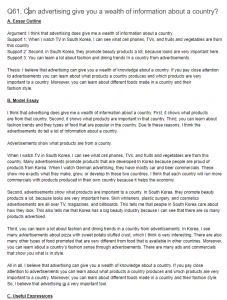 Argument: I think that advertising does give me a wealth of information about a country. Support 2: Second, in South Korea, they promote beauty products a lot, because looks are very important here. Support 3: You can learn a lot about fashion and dining trends In a country from advertisements. Thesis: I believe that advertising can give you a wealth of knowledge about a country. If you pay close attention to advertisements you can learn about what products a country produces and which products are very important to a country. Moreover, you can learn about different foods made in a country and their fashion style. I think that advertising does give me a wealth of information about a country. First, it shows what products are from that country. Second, it shows what products are important in that country. Third, you can learn about fashion trends and they types of food that are popular in the country. Due to these reasons, I think theadvertisements do tell a lot of Information about a country. Advertisements show what products are from a county. When I watch TV in South Korea, I can see what cell phones, TVs, and fruits and vegetables are from this country. Many advertisements promote products that are developed tn Korea because people are proud of products from Korea. When I watch German advertising, they have mostly car and beer commercials. These show rne exactly what they make, grow, or develop tn these two countries. I think that each country will run more commercials with products produced in their own country because it helps the economy. Second, advertisements show what products are important to a county. In South Korea, they promote beauty products a lot, because looks are very important here. Skin whiteners, plastic surgery, and cosmetics advertisements are all over TV, magazines, and billboards. This tells me that people in South Korea care about how they look. This also tells me that Korea has a big beauty industry because I can see that there are so many products advertised. Third, you can learn a lot about fashion and dining trends in a country from advertisements. In Korea, I see many advertisements about pizza with sweet potato stuffed crust, which I think is very interesting. There are also many other types of food promoted that are very different from food that is available in other countries. Moreover, you can learn about a country’s fashion sense through advertisements. There are many ads and commercials that show you what is in style. All in all, I believe that advertising can give you a wealth of knowledge about a country. If you pay close attention to advertisements you can learn about what products a country produces and which products are very important to a country. Moreover, you can learn about different foods made in a country and their fashion style. So, I believe that advertising ia a very important tool.